Black henbane is a native plant of Europe commonly found in waste areas and pastures. It is poisonous to both animals and humans. 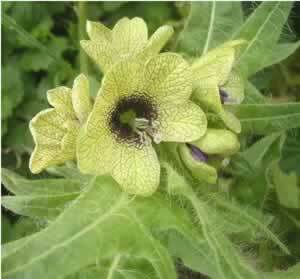 Henbane has been used medicinally since the time of Pliny in ancient Greece. 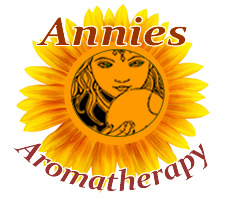 Henbane's continued popularity today is as a psychoactive herb. While henbane has some limited medical value in controlled circumstances, do not experiment with it. 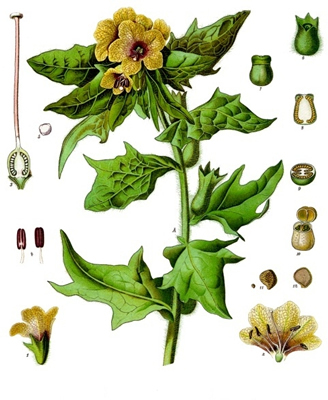 Henbane delights most to grow in saturnine places, and whole cart loads of it may be found near the places where they empty the common Jakes, and scarce a ditch to be found without it growing by it. Ergo, it is an herb of Saturn. The leaves of Henbane do cool all hot inflammations in the eyes, or any other part of the body; and are good to assuage all manner of swellings of the privities, or women's breasts, or elsewhere, if they be boiled in wine, and either applied themselves, or the fomentation warm; it also assuages the pain of the gout, the sciatica, and other pains in the joints which arise from a hot cause. Take notice, that this herb must never be taken inwardly; outwardly, an oil ointment, or plaister of it, is most admirable for the gout, to cool the veneral heat of the reins in the French pox; to stop the tooth- ache, being applied to the aching side: to allay all inflammations, and to help the diseases before premised.